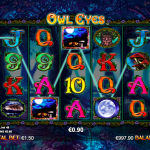 Owl Eyes Nova is a video slot game from NextGen Gaming. The design of the game is spectacular. You enter a mystical forest during the night. The fireflies are lightning the way for you, as you spin the reels and try to match the symbols. The sound effects are a great addition to the theme and bring the game to life. There are plenty of special symbols and features that will make the game play more interesting for you. 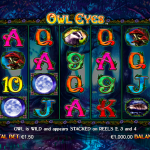 The owl is the wild and it appears on the second, third and fourth reel. Its function is to substitute for every other symbol except for the scatter to complete a winning line. The moon is the scatter symbol and it is the key to the main feature. To activate the free spins you need to land at least 3 scatter symbols to receive 5 free spins. During the feature more stacked wilds are added to the reels. 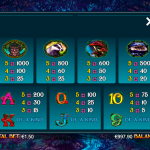 The good news here is that the free spins feature can be re-triggered if you land 3 or more scatter symbols. Owl Eyes Nova is an amazing game, but then again this comes as no surprise since it comes from Nextgen Gaming. The first thing that we noticed, and that attracted us the most was the beautiful design of the game. The symbols are very well crafted and the background of the game takes us on a journey to a mystery world. This can be a great slot when you want to escape the reality just for a while and just concentrate on playing your new favorite game. We highly advise you to give this game a chance, and we are sure you will love it, just like we did. For another great engaging game you should consider playing Oil Mania a 5 reel slot by NextGen.